Lotus is one of two species of aquatic plant. It is native to Tropical Asia and Queensland, Australia. It is commonly cultivated in water gardens. It is also the national flower of India and Vietnam. The roots of lotus are planted in the soil of the pond or river bottom, while the leaves float on top of the water surface or are held well above it. The flowers are usually found on thick stems rising several centimeters above the leaves. The plant normally grows up to a height of about 150 cm and a horizontal spread of up to 3 meters. An individual lotus can live for over a thousand years. The flowers, seeds, young leaves, and roots are all edible. In Asia, the petals are sometimes used for garnish, while the large leaves are used as a wrap for food. 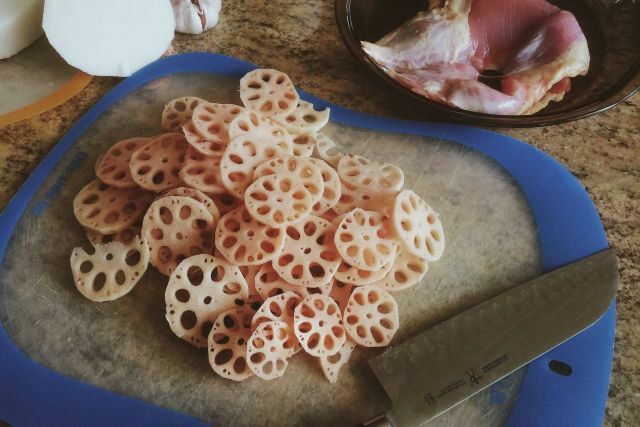 In South Indian states, the Lotus Stem is sliced, marinated with salt to dry and the dried slices are fried and used as a side dish.